Texas ranks third among the top five states with the highest employment level in this profession. The number of certified nursing assistants working in the state, as on May 2013 was 86,630, according to the U.S. Bureau of Labor Statistics. The employment per thousand jobs was 7.94. The mean hourly and yearly wages amounted around $11.45 and $23,810 respectively. As compared to the salary of CNAs for job postings nationally, the nursing aide salary in TX was unfortunately 3% lower in January 2015 (according to indeed.com). The average income in TX was reported to be $24,000 per year. 90% of CNAs earned an income less than $31,220; 10% received more than $31,220. 75% of certified nurse assistants waged less than $27,390; remaining 25% managed to earn more than $27,390. 50% of the employees were provided less than $22,980; rest 50% offered more than $22,980. 25% of CNAs were paid annual wages less than $20,050; 75% were paid more than $20,050. 10% of employees were salaried less than $17,430; 90% were offered more than $17,430. An important aspect that affects the salary of a certified nursing assistant is the location where s/he is employed. As per salary.com, in January 2015, the median annual income in different cities of Texas was between $21,687 and $30,919 while the median hourly wages fluctuated from $10 to $15. The lowest paying cities were Midland and Odessa while the highest paying cities were Pasadena and Houston. The median monthly and weekly salaries varied from $1,807 to $2,577, and $417 to $595 respectively. The job title that a CNA holds illustrates his/her area of specialization in a particular field of nursing. Besides, it plays a major role in deciding salary figures. In January 2015, people holding the designation of CNA Hospice earned an annual salary of $31,000. CNA Rrmc made $29,000. Medical Assistant Family Practice took home $28,000. The lowest salaried workers were Correctional Prison Facility CNA, who managed to earn $14,000. Through the BLS reports, it is expected that the employment growth for certified nursing assistants will rise by 21 percent in the impending years. With the rising demand for more health care services, the job opportunities of CNAs will unquestionably increase, especially in the clinics and hospitals. To find a job in the nursing homes may be a bit difficult since many of these rely on government funding. Question 1 – How much do CNAs earn in Texas? Answer – In Texas, CNAs can expect an annual salary of $24,000. Question 2 – What job title should I target to earn my living in the state? 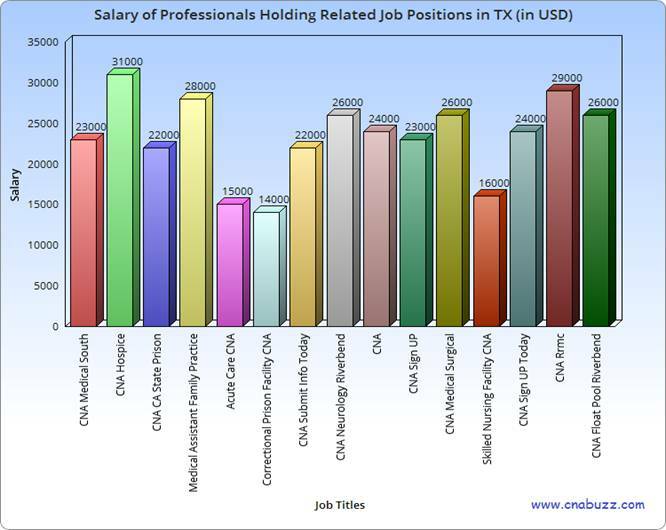 Answer – CNA Hospice is the highest paid job title with annual salary $31,000. Other top paying job titles are CNA Rrmc ($29,000), Medical Assistant Family Practice ($28,000), CNA Neurology Riverbend ($26,000), CNA Medical Surgical ($26,000), and CNA Float Pool Riverbend ($26,000).